Charleston port plays a key role in the supply chain by offering reliable operations as well as flexibility. For an example of the crucial role large ports play in the United States, go back only as far as September, when Hurricane Maria devastated Puerto Rico. Florida’s Port of Jacksonville (JAXPORT) served as the main staging area for San Juan-bound relief carried by the likes of shipping companies TOTE Maritime, Crowley Maritime, Trailer Bridge and Pasha. Owning and managing three public marine terminals and a passenger cruise terminal, JAXPORT is also helping to lead the liquid natural gas revolution in the maritime industry, whether it be from the development of landside bunkering and liquefaction plants to multimillion-dollar investments in LNG-powered vessels. Bigger is also better on the opposite end of the Sunshine State, where PortMiami saw containerized cargo traffic increase 18.5 percent in August over the same month the previous year, with a record-setting 99,546 twenty-foot equivalent units. “Our seaport has been steadily capturing new business thanks to more than $1.3 billion of completed capital infrastructure investments,” boasts Miami-Dade Mayor Carlos A. Gimenez. That work included dredging the shipping channel to -50/-52 feet, completing construction of a new port access tunnel to speed vehicular traffic on and off the port, purchasing four super post-Panamax cranes, and installing an on-dock rail link connecting Miami to 70 percent of the U.S. population in less than four days. “The PortMiami team understands that the key to the port’s growth and success is largely dependent on our commitment to providing our partners with fast and reliable service,” says Juan M. Kuryla, the CEO of a port credited with contributing more than $41.4 billion annually to Miami-Dade County and generating 324,000 direct, indirect and induced jobs. You want staggering numbers? A New Jersey Transportation Planning Authority study found the Port of New York and New Jersey was responsible for $25.7 billion in personal income and $64.8 billion in business income last year. Meanwhile, a separate New York Shipping Association report states that the same port accounted for more than 400,000 jobs and nearly $8.5 billion in federal, state and local tax revenue. 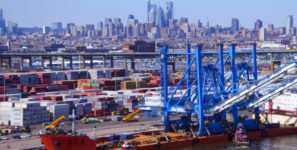 Shippers are also attracted to the (relatively) nearby Port of Philadelphia, which in August achieved its highest monthly total of cargo handled ever, with 667,069 metric tons. PhilaPort’s 54,185 TEUs of container throughput and 109,604 metric tons of forest products also broke records the same month. More than $265 million in state funds and $127.8 million in federal funds are earmarked for a harbor deepening project to accommodate those big ships, but “the current proposal will not cover all the work that could be completed in a year,” according to GPA Board Chairman Jimmy Allgood. “We are working with our leaders in Washington in hopes that they will provide additional funds through the U.S. Army Corps of Engineers’ work plan.” Meanwhile, Allgood’s board just approved $42.27 million to untie road and rail congestion around Savannah’s docks—part of a larger $128 million Mega Rail Terminal project—and $13.2 million to expand the existing Gate 8 at Garden City Terminal. The goal, GPA officials say, is to not only expand the Port of Savannah’s on-dock rail capacity by 100 percent but position it to rapidly increase service to an arc of inland markets from Memphis to Chicago. On the Left Coast, lemons that locals refer to as stringent air quality regulations are being turned into that lemonade everyone knows as economic stimulus. The NASCO shipyard in San Diego is building new LNG ships to replace their polluting diesel counterparts. Blame the success of the Pacific Rim’s mighty Ports of Los Angeles and Long Beach, where demands to reduce truck traffic forced the industry to look at alternatives. Keeping containers on ships bound for ports closer to their final destinations—rather than on long-haul trucks clogging Interstate 5—is part of the U.S. Maritime Administration-promoted Marine Highway strategy being mirrored on the East Coast, where the Philly Shipyard in Philadelphia is building LNG ships to replace diesels and remove trucks from the I-95 corridor. Another beneficiary in the quest for alternatives to the Ports of LA and Long Beach are their counterparts in the Pacific Northwest.The Port of Everett (Washington) Commission on Oct. 24 voted to collect bids for a $36 million South Terminal Modernization project. Coupled with the installation of double rail siding, modernizing will ensure the port is ready for the next generation of over-dimensional cargo, including aerospace parts for Boeing’s new 777X wide-body aircraft. Calling it “a bold and momentous step,” Port of Everett CEO Les Reardanz likes where his seaport is positioning itself in the industry. “This is the largest capital project the port has undertaken since the construction of Mount Baker Terminal in 2005,” Reardanz says. “Staff has been doing a great job thinking strategically to phase, finance and permit this project in a way that delivers this project by December 2019.” Keep in mind that his port already supports nearly $30 billion worth of U.S. exports annually, making it the largest customs district in Washington state, where their regional transportation network supports more than 35,000 jobs and generates $313 million in state and local tax revenues. Everett would have to double those numbers to approach the South Carolina Ports Authority, which owns and operates seaports in Charleston, Georgetown and Greer that handle international commerce valued at more than $63 billion annually. While receiving no direct taxpayer subsidy, port operations facilitate 187,200 statewide jobs and generate nearly $53 billion in annual economic activity. That’s what happens when you’re home to the Southeast’s deepest port—and you don’t rest on that. On Oct. 30, after SC Ports had plopped down about $70 million for six new cranes to handle its record-breaking growth, CEO Jim Newsome announced the U.S. Army Corps of Engineers had awarded a second dredging contract for the Charleston Harbor Deepening Project that will ensure a 52-foot depth, the East Coast’s deepest. The next day, it was definitely a treat and not a Halloween trick when Newsome unveiled the Supply Chain Authority, an internal consulting service that has SC Ports sharing expertise in IT, operations, terminals and commercial and economic development with customers to improve their supply chains. For the amount of activity that happens daily, it’s amazing that Delaware’s Port of Wilmington has a reputation for chilling out, boasting the largest dock-side refrigerated complex in North America. Founded in 1923 at the confluence of the Delaware and Christina rivers, 65 miles from the Atlantic Ocean, the full-service, deepwater port and marine terminal is now the busiest on the Delaware River. Handling about 400 vessels and more than 6 million tons of import/export cargo annually, the Diamond State Port Corp.-owned and -operated seaport is also No. 1 on the continent for imports of bananas, fresh juice and juice concentrate. Perhaps nothing reinforces the bigger is better notion more than a port being hit at the beginning of the month with major adversity and then by the end of the month celebrating another major triumph. That’s what happened in November to the Port of Baltimore, which first learned Jacksonville, Florida-based CSX Transportation was withdrawing its support for the long-awaited Howard Street Tunnel under downtown, prompting state officials to cancel a request for $155 million in federal money for a project hoped to be a boon to the port. True that: Even before this year’s record growth, the port had leapt to become the fourth busiest port in the country in 2016, and it is now the nation’s busiest for farm and construction equipment and cars and trucks.